In 1810, Susquehanna County was formed out of Luzerne County and in 1812, Montrose was made the county seat. At that time, Montrose was a small cluster of houses at the intersection of the road to Tunkhannock and old Milford and Owego Road or Turnpike. This later road eventually became State Route 706, and was named Church Street where it went through town due to the number of churches built on it. The following year, a courthouse was constructed north of the intersection at the top of a hill and the wide street leading to it would be called Public Ave. Montrose was incorporated as a town in 1824. It derived its importance from being the county seat and became a trading point for agricultural community from the surrounding area. Many of the early settlers of the village proper were from New England who were Congregationalists and they were the first to build a church. In 1826, a Presbyterian Church was built in town on the main road. The Episcopal Church was chartered in 1831, by Congregationalists and Presbyterians who were confirmed as Episcopalians. The corner stone was laid by Bishop Onderonk on June 2, 1832, and the first service was held in the new structure on Christmas Eve, 1832. 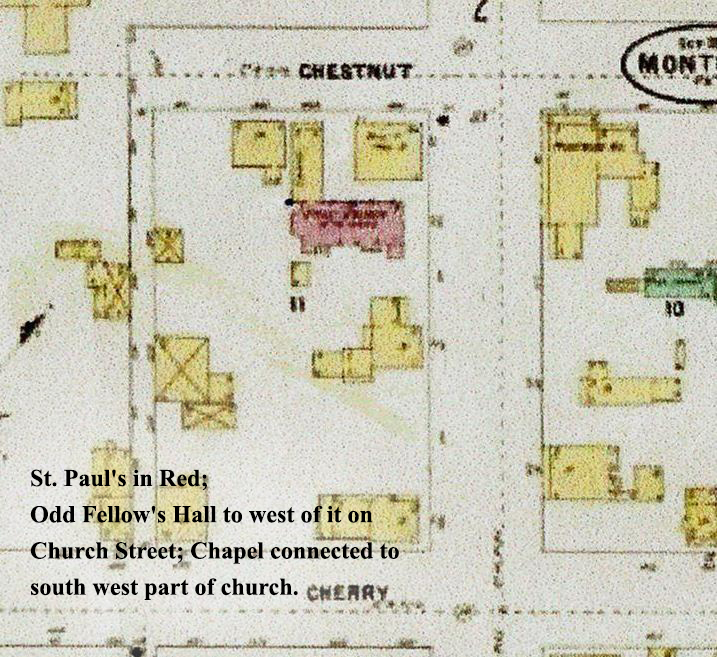 The original church building was located at the corner of Chestnut and Cedar streets on the rear of Montrose Lot 56. It was donated by Reuben Locke, a tailor, who lived in a house on the front of the lot on the corner of Church St. It cost $1200 to build. An organ was purchased for $95. Montrose had had an initial growth spurt and over 400 persons were listed in 74 households within its boundaries or nearby on the 1830 Census. As an indication of how rural the area still was, they were still hunting and killing wolves in Lawsville that year. By 1845, Montrose had seven places of worship. St. Paul’s growth mirrored that of the Borough and in 1847, six new members were confirmed. In 1849, a parsonage was built at the corner of Cherry and Cedar Streets. Parishioner growth continued steadily and after two decades of use, church membership outgrew its original building. Henry Drinker (1804-1868) of Philadelphia, who lived on South Main St., was the moving force in building the current church. Emily Blackman says in her 1873 Susquehanna history: “It is to his influence and means that the congregation of St. Paul’s Protestant Episcopal church of Montrose are largely indebted for the handsome house of worship they now occupy.” In 1856, the congregation purchased the property from the Odd Fellows on Church Street to the east of their hall “for the purpose of erecting a stone or brick church thereon, with a roof of slate or metal.” A new and larger sanctuary was built on it which one reporter declared was: “the handsomest church … out of the city of Philadelphia.” The cornerstone was laid in June 1856. The old church and lot were sold to the Roman Catholics, who held services there for many years. Through Drinker’s connections and largesse, the new building was designed by Richard Upjohn (1802-1878), the foremost American ecclesiastical architect of the mid-19th Century. Originally from England, Upjohn was responsible for launching the popularity of the Gothic Revival style in the United States. The new church was built by a local contractor, William Boyd, known as the “veteran builder of Montrose,” who had just completed the new courthouse. Boyd used local white oak for the interior work. It was the first building in the borough to be covered by a slate roof. Upjohn designed St. Paul’s in what is often called the “country Gothic” style, with a tower and spire in the north-eastern corner. The bricks were made locally. It has a simple nave without aisles, and contained two areas of open pews. It was built next to and close to the Odd Fellow’s Hall, which was to the west, and could seat about 300 people. A brilliant rose window, which is visible from Church Street, was built over the main entrance. The chancel is semi-octagonal and was lighted by three windows behind the altar that were later replaced by Tiffany windows. Although it had a bell tower, there was no bell initially. A coal furnace was added for heat and few changes were made for the next fifty years. The total cost was estimated to be $7,500. The new church was consecrated on July 17, 1857. In 1860, St. Paul’s had 60 communicants. In 1866, St. Paul’s purchased an organ in Boston for $1,000 and located it in the rear of the church. It was replaced in 1912, and the new one was installed on the left wall of the chancel. Originally, it contained 864 “speaking” pipes and was water-powered. The back entrance and east window of the chancel had to be removed for the new organ chamber to fit. A new oak floor and altar railing were put in at this time and the choir was moved up next to the organ. To entice the Rev. Warriner to return from Philadelphia, in 1874, a larger rectory was purchased on South Main Street (now the Regan Funeral Home, 232 South Main St.) It was used until 1906. In 1883, the old Isaac Post house immediately across the street from church was converted into the Montrose House hotel. It was torn down in 1926 and replaced by the Montrose Inn, now a bank. For the next fifty yeas, it was the first building parishioners would see coming out of church. In 1896, two four-light chandeliers, one three-light chandelier, and two bracket lamps were added to the inside of the church and were lighted with oil. By 1901, electricity had come to town and electric lights added. The old lamps were sent to St. Andrew’s in Springville. With electricity came an electric motor for the organ pump, which was completely electrified in 1927. In 1902, the first of three Tiffany windows replaced the center one behind the altar. Through this time, Montrose remained a sleepy little town surrounded by an agricultural community and Church Street remained unpaved well into the 19th century. The picture above was taken about 1908 looking west on Church Street toward St. Paul’s at the Presbyterian Church, which is visible on the right. The lot to the east of church on Church Street was divided and a house was built between the two existing structures. By 2000, this house would be next to the Memorial Garden. Businesses and law firms opened on both sides of Public Avenue with parking for buggies and horses. In 1906, Rev. Edward Warriner retired and purchased the South Main rectory. That same year, a house at what would become 264 Church Street to the east of church was purchased for a rectory. Rectors for the next 90 years would live in it. By this time, Montrose had almost 2,000 residents and St. Paul’s had grown into a respectfully sized congregation. In 1914, 26 persons were confirmed. In 1923, the present altar was purchased. It was originally placed on the front wall under the windows. In 1925, Samuel Warriner (b. 1867) donated the funds to obtain a Parish House. The Vestry purchased the old Odd Fellows Hall and lot next door west of the church on the corner of Chestnut and Church Streets. It was purchased for $12,000. The new structure, which was made of brick, connected to the existing church. The building was dedicated in 1927. The cost was $75,000. The Parish House contained a large Parish Hall, a Guild Room for meetings, choir dressing rooms, a kitchen, bathrooms, office, and sacristy. The south side of the building was built close to the property line leaving less than three feet from the structure behind. Three rooms were constructed upstairs for an apartment for a Sexton. A second coal furnace was added under the structure for heating. The new Parish House added immeasurably to the life of the parish and the community. By 1927, St. Paul’s was a fully active and well-attended church. It had a Church School with 55 members, St. Paul’s Guild of 29, the Alter Guild of 30, a Choir of 22, Women’s Auxiliary of 20, and a Brotherhood of St. Andrew’s of 7. In October of 1933, St. Paul’s celebrated with much fan fare, its 100th Anniversary and the following year a boys’ choir was formed. In 1938, the hedge that still surrounds the church and parish house was planted by the Montrose Garden Club and “kneeling benches” were added to the pews. In 1956, pads were put on these oak kneelers and broken ones were replaced. After World War II, like the rest of America, Montrose experienced an explosion of post war babies and an active and robust Sunday school program was initiated. In 1960, Montrose reached its population peak with 2,300 residents. St. Paul’s had more communicants than it ever had. It was about this time the Garden Club began looking into acquiring the lot to the east of church. In 1965, St. Paul’s purchased the property from the Knoll family and the house and garage were demolished the following year. It was called “St. Paul’s Memorial Garden” and a well thought out planting plan was implemented. Several memorial statues and plaques were placed in it through the years. The front part of the property where the house had been located, was developed into the “Miss Mary Garden” in recognition of Mary Mitchell who had served as a nurse in the Civil War. This garden was the recipient of a special award by the Garden Federation of Pennsylvania in 1976. It was felt that along with the Parish House, the Memorial Garden gave space and symmetry to the church. In 1963, a major restoration campaign raised money for repair work at the church and Parish House. Much of the needed deterioration was caused by water and dampness. The basements of the church and Parish House underwent major repairs. B-Dry Systems dug a French drain around the property and the basement was fitted out with classrooms for the Sunday school. Additionally, the basement of the Parish House became the Celtic Room. In 1971, the slate roof was replaced for $18,000. In the early 1970s, the stairs to the front door were replaced by handsome bluestone ones and a concrete sidewalk added. By 1976, the existing coal furnace was near its end and a very cold winter led to the church having services in the Parish Hall. Possibly as a result, coffee hour began in the Hall that winter and has continued as an honored tradition since. The following year, the coal-fired furnace was replaced with two new oil furnaces and the coal bin was used for storage. In 1980, major repairs were made to the belfry entrance. Concrete and block stairs were built and a wheel chair ramp was added to the bell tower. However, the ramp proved to be too steep to be workable. The ramp was replaced in 2016, with blue stone stairs to match the ones at the front door of the church. In 1985, a Community Access television channel on Time Warner cable was installed in the basement of the parish house, and St. Paul’s began making video recordings of the 10 o’clock service, broadcasting it at 11:15. Since that time, the church has been recording services through a variety of technologies and they are now live streamed and put on the internet. In 2009, due to decreased membership, St. Paul’s went from two services Sunday morning to one. Additionally, to meet the various handicapped requirements, a loan was obtained from the Diocese and a ramp walkway was built from Church Street through the Garth into the cloister. By this time, St. Paul’s structure again needed another major maintenance update. The electrical system needed modernized and a new coat of paint put on most of the walls. Additionally, the plaster on the ceilings in most of the Parish Hall rooms was falling off. In 2012, after several generous financial bequests, the Property Committee came up with a five-year plan to update the buildings. In 2014, with an eye toward safety and energy usage, the first of many changes were made. Fuse boxes were replaced with circuit breakers and ungrounded outlets were removed and grounded ones added. Where feasible, old wiring was replaced with new. All lights in both buildings were replaced with newer LED lighting and old florescent ballast lights were switched for energy efficient ones. In 2015, the old oil furnaces were replaced with natural gas ones and new blowers were added in the church and cloister. Additionally, new energy efficient replacement windows were added to the Parish House. Major renovations were also done to the chancel area of the church. The altar rail was moved forward and the altar area extended and the chancel shortened. The ceiling was painted blue with gold stars added. The choir and their benches were moved down from the chancel into the left front of the nave. A columbarium was built in the back of the nave using the white oak from two pews that were removed and a raised stand was added to the area near the bell tower door to facilitate videotaping. Glass doors were added to the front, which were energy efficient and let in light during the service. In 2016, Church Street was widened by the State to handle the gas drilling truck traffic and St. Paul’s lost its parking and several mature trees in front of the church. A parking lot was added to the back of the Memorial Garden and a lighted walkway was built from it to Church Street. The garden was renamed the Elle McKeage Memorial Garden and dedicated in the spring. A new electronic St. Paul’s Church sign replaced the old static one. In the fall of 2017, the kitchen, the final project on the five-year plan, was completely renovated. For over 180 years, St. Paul’s Episcopal Church and its communicants have been fully integrated into the ebb and flow of the Montrose community. The church and its parishioners are a part of the fabric of Montrose and we look forward to serving our town for another 180 years. Blackman, Emily C., History of Susquehanna County, Pennsylvania, Claxton, Remsen & Haffelfinger, Philadelphia, Pa., 1873. Hotchkin, M.A., Country Clergy of Pennsylvania, P.W. Ziegler & Co., Philadelphia, Pa., 1890. Merrell, Margaret H., A History of St. Paul’s Parish, Montrose, Pa., 1956. Miller, Rev, Jonathan Wesley, History of the Diocese of Central Pennsylvania, 1871-1909, Frackville, Pa., 1909. Stark, Edward, A History of St. Paul’s Episcopal Church Montrose, Pennsylvania 1957- 2008, Privately Printed, Montrose, Pa., 2008. Stocker, Rhamanthus M., Centennial History of Susquehanna County, Pennsylvania, R.T. Peck, Philadelphia, Pa., 1887. Montrose, Susquehanna County, Pennsylvania, “Birds-Eye-View”, T.M. Flower & James b. Moyer, 1890. Map of Susquehanna County, Hopkins, Griffith Morgan, Smith, Robert Pearsall, Published by Lee and Marsh, 1858.